← Gail Atkinson, earthquake expert: Low-volume fracking found still dangerous; Dutch Court Orders NAM to Immediately Compensate Homeowners in Frac Quake Damages Zone in Groningen for Depreciation even if Homes Not Sold. Will the Corporate Giant Heed the Court? Most Likely Not. Here, the prize is condensate, an ultra-light oil that’s perfect for diluting the heavy tar-sands crude for which Alberta is known. More locally produced diluent would be a plus for Canadian companies that now depend on the U.S. — and for communities like Fox Creek that are feeling the economic benefits along with fracking-linked earthquakes. 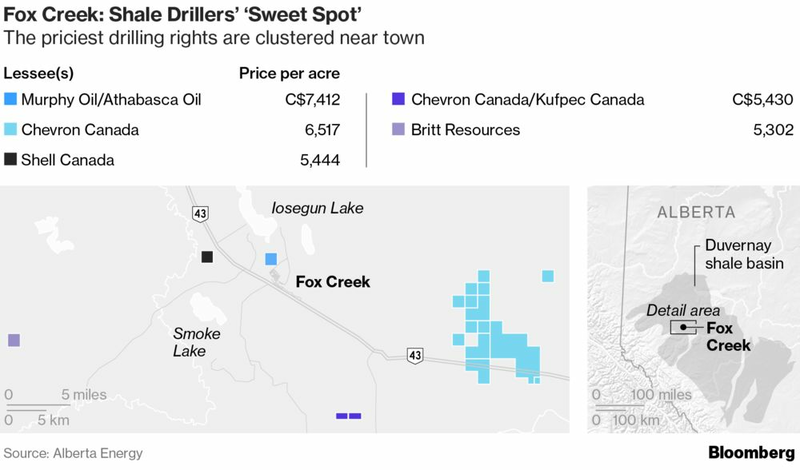 More of both may be in the offing as drillers flock in Chevron’s wake into the Duvernay region. 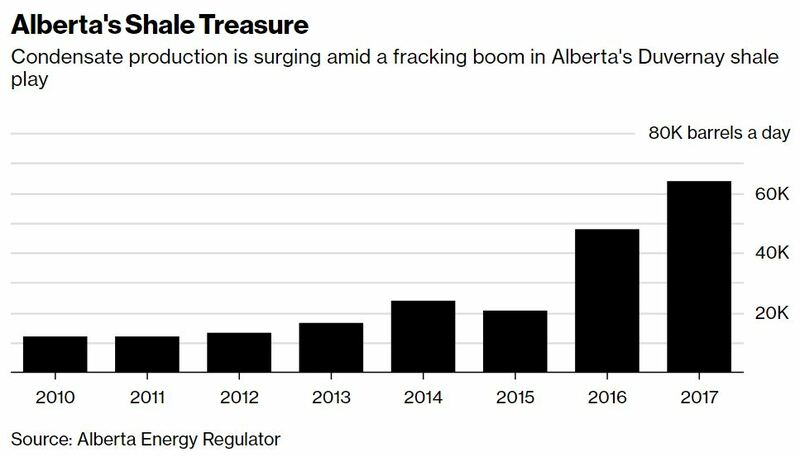 Domestic companies use around 600,000 barrels of condensate a day, and production of the hydrocarbon in Alberta is surging. Output reached 64,000 barrels a day last year, the highest in provincial production records dating back to 2010. In the Duvernay, oil and gas output is poised to more than triple in the next two years to the equivalent of 300,000 barrels of oil a day, according to Stephen Kallir, upstream research analyst at Wood Mackenzie in Calgary. The pace of activity is only getting busier after Chevron, which owns the most drilling rights in the area, announced plans to develop about 55,000 acres (22,000 hectares) of land in the so-called East Kaybob section of the Duvernay, near Fox Creek. Other companies are expected to follow suit, Hailes said. The Kaybob section already holds 80 percent of Duvernay wells and accounted for 90 percent of the formation’s production, according to an October BMO Capital Markets report. The majority of the play can be economically produced for $55 a barrel, Wood Mackenzie’s Kallir said. That’s a mixed blessing for Fox Creek, Mayor Hailes explained as he drove his Toyota Highlander through the town, pointing to the fruits of the area’s newfound fortune. On the left is a new $8 million fire house. To the right, a $32 million recreational center [Who in their right mind needs a 32 Million dollar rec centre? Industry? 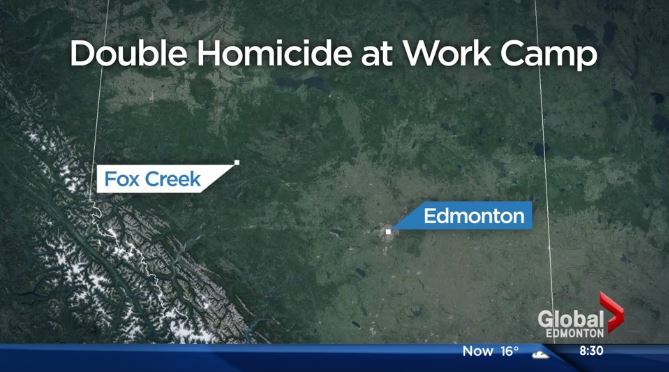 To keep their drug-filled frac workers from going mad or on more double murder rampages?] and multiplex are going up. Farther down the road are new ski trails and a bicycle track. 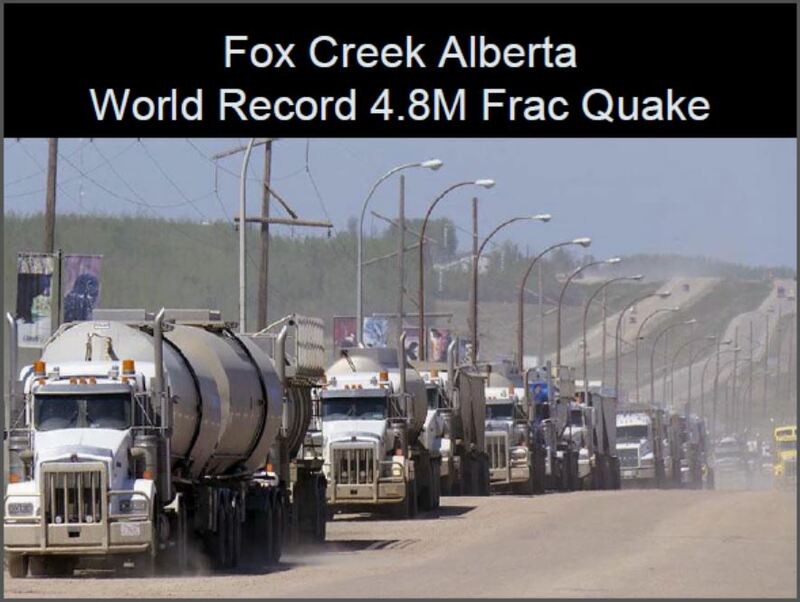 On the other hand, drilling has been so intense near Fox Creek that its been linked to a series of earthquakes. One tremor measured 4.6 in magnitude, one of the two biggest human-induced seismic event in Canada’s history, Honn Kao, research scientist at the Geological Survey of Canada, said by phone. Madrid-based oil producer Repsol S.A. took responsibility for that one, telling Bloomberg that the quake was triggered by its hydraulic fracturing operations in the area. Still, the Duvernay’s promises are too good to ignore. First explored in 2011, the formation holds the equivalent of 25 years of Alberta’s natural gas production and 17 years light oil and condensate output, according to Canada’s National Energy Board. 2016 03 03: Devolution of a Species. 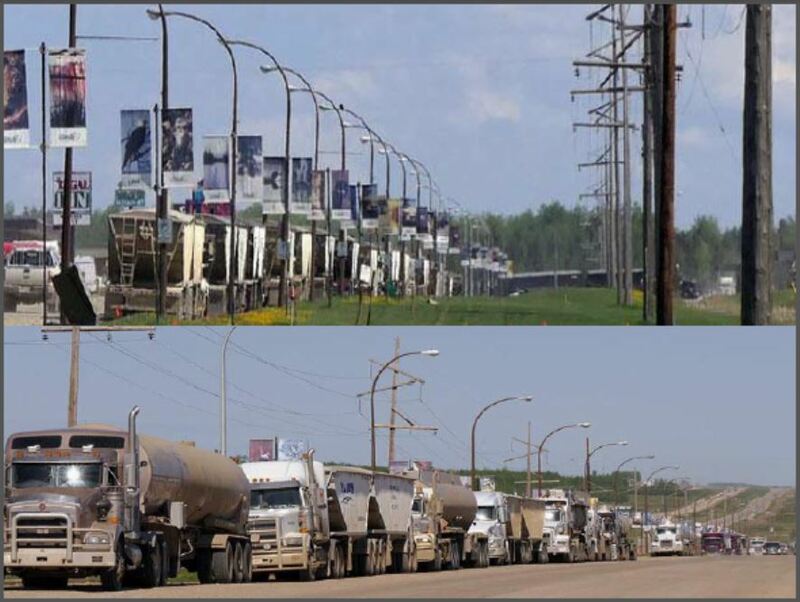 Alberta Venture Special Report: Towns in Alberta’s industrial heartland ran out of water last summer. Is fracking to blame? 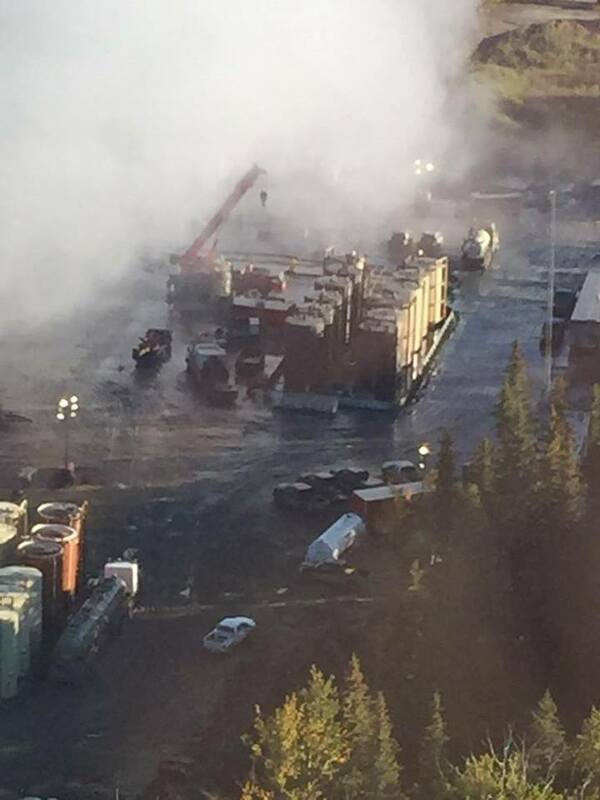 Is “No Duty of Care” legally immune AER’s one-size-fits-all, world-record quaking frac frenzy drying up Fox Creek’s drinking water supply? 2015 12 18: How much has Fox Creek paid for hauled water? What happens when Fox Creek runs out of money? How will they fight fires when they run out of water? 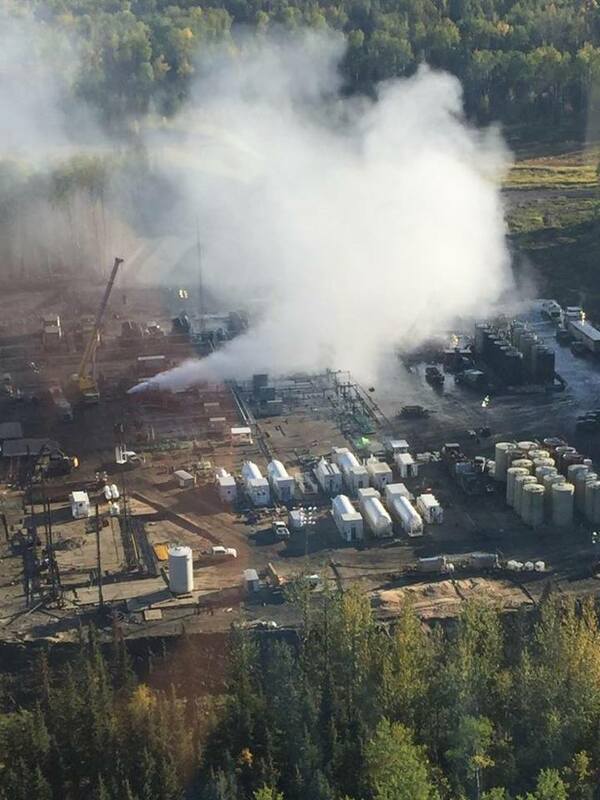 2015 09 22: AER & Encana Lying Update: Encana’s Deadly Sour Gas Blow Out at Fox Creek: Did Alberta’s Energy Minister lie for Encana & “No Duty of Care,” cover-up agent extraordinaire, the AER? 2015 09 21: AER Responding to Encana Sour Gas Well Blowout in AER’s blanket approval, fracing free-for-all near Fox Creek. Was it caused by what Mayor Ahn fears? Fracquakes? 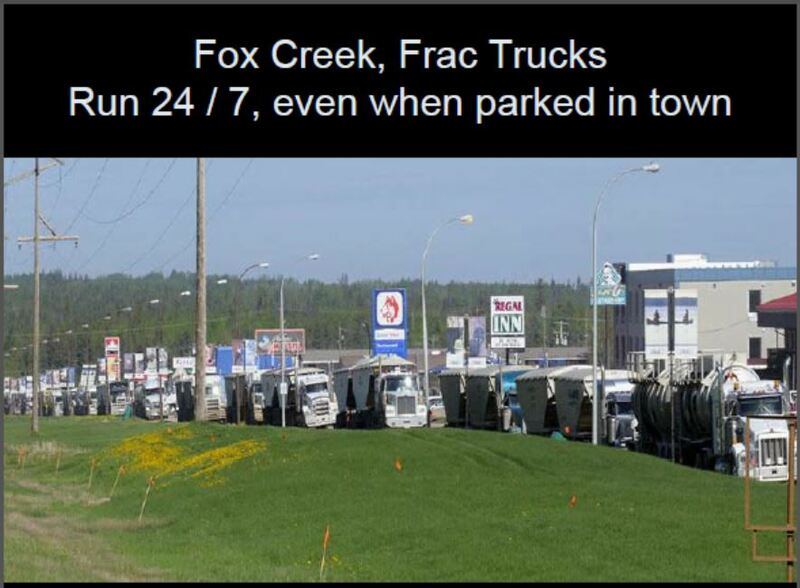 2015 07 25: Fox Creek Mayor Jim Ahn rightfully worried about frac quakes harming sour gas infrastructure in the community. 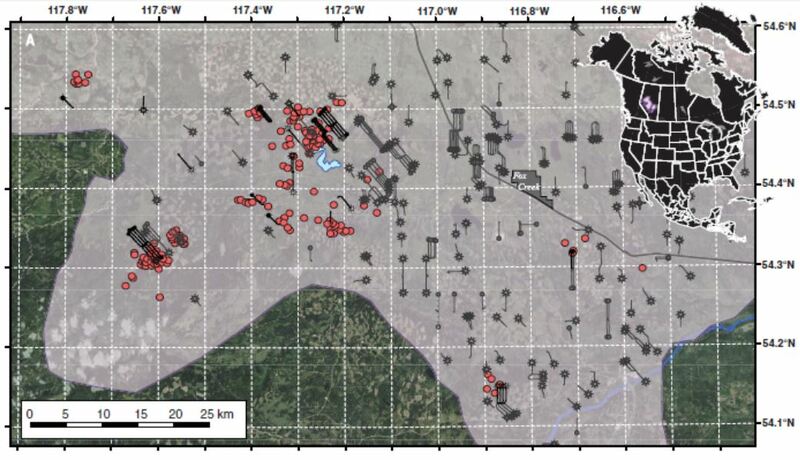 How much damage have the quakes already caused sour gas wellbores and pipelines? The “landmark” is the town’s water reservoir, a town running out of water after the frac’ers moved in. Don’t fret about water vanishing in Fox Creek. Chevron will save the day, and repaint the town’s water tower, complete with earthquake cracks. If you and your children are thirsty or want a bath, or want to go fishing but the water bodies have all been frac’d dry, you can look at Chevron’s generous paint (aka con) job and pretend. 2015 07 03: AER and Gerard Protti trying to erase the murders in the Frac Hell Free-for-all they created and enable at Fox Creek? How will the AER restore those lives? How will they wipe out the horror facing residents and workers? 2015 05 27: Town of Fox Creek Water Ban on ALL Non-Essential Use. Does that include fracking in AER’s Deregulated, Blanket Approval, Frac Frenzy, Play-Based Pilot Project surrounding Fox Creek?